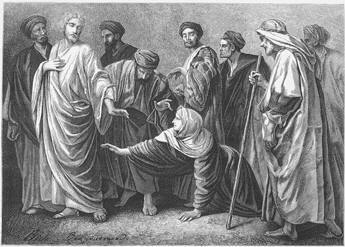 Then one of the synagogue leaders, named Jairus, came, and when he saw Jesus, he fell at his feet. He pleaded earnestly with him, “My little daughter is dying. Please come and put your hands on her so that she will be healed and live.” So Jesus went with him. As it happened, Jesus was in this crowd only because he was on his way to heal the feverish daughter of a synagogue ruler who pleaded that Jesus have mercy on his dying child. Mark likes to tell his stories about Jesus like sandwiches — one story sandwiched in the middle of another—kind of like Jesus was sandwiched in this crowd. Yes, that’s exactly what Jesus could ask. He could ask because he’d felt something quite different from the normal collisions of shoulders and elbows and sandals and hips and thighs. He’d felt that “power had gone out from him” (verse 30). He’d sensed that someone had touched his clothes with a definite purpose in mind, a definite need, and that this person had done so believing that through this act God would give deliverance. And indeed God had. Mark fills in the story for us, even though at the time the disciples were in the dark about what had happened. It seems that a woman had been suffering from debilitating menstrual hemorrhaging for 12 years. This woman had spent everything on doctors to try to find a cure, and they had done nothing but make her problem worse. Now she was out of options, but that’s when she heard that Jesus was coming to town. She decided that if she could just touch his clothes, she would be healed. So she bored her way through the sweaty bodies, came up behind Jesus, and touched his cloak. Instantly, the bleeding stopped and her suffering was over. The mustard from Mark’s sandwich of two stories begins to leak over onto both slices of bread at this point. Jairus, the synagogue ruler, was not afraid to walk right up to Jesus, fall at Jesus’ feet, and plead for the daughter he loved. But the sick woman was different. She was just as determined and just as believing as Jairus in Jesus’ power to save. But she was too afraid to approach this mysterious man of God head on. Unlike Jairus, she sneaked up behind Jesus, flicked a finger across the wrinkles of his robe and sunk back into the anonymity of the crowd. But despite her fear, despite her low opinion of herself, maybe because of her status as a woman, but even more likely because of her status as unclean because of the purity laws about menstrual flow, Jesus noticed her. And he called her to him. And he called her daughter. Meanwhile, Jairus’ daughter died, and the messengers of this news told Jairus not to bother Jesus any more about it — after all, it was too late. But Jesus ignored them. He went straight to Jairus’ house and despite the scorn and disbelief at his statement that the girl was not dead, but only sleeping, he took her by the hand and gave her back her life and Jairus back his daughter. Jesus doesn’t care who you are. He doesn’t care if you’re timid and shy, young or old, a leader or an outcast. He knows you, loves you, cares about your needs and fears and crises, and is ready to help. He listens to your up-front, head-on pleas and he senses hopeful hearts at the back of the line and behind the door. Your personality, your temperament, your status, nor even (especially) your sinful history can erect a barrier he can’t bring down like the walls of Jericho. What’s your need? What’s your crisis? What’s your fear? Take it to Jesus. Take it to him in whatever way works for you. He loves you. He’s on your side. And he’s waiting.